The mystery of human feet washing up on the shores of the Pacific Northwest is deepening once again. 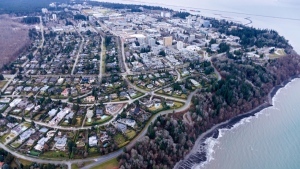 What appears to be a sixth foot has been found on a straight of Juan de Fuca beach, approximately 50 kilometres west of Port Angeles in Washington state. Police say the large black-top athletic shoe for a right foot contains bones and flesh. Tests will now be done to determine if the remains are human. On August 20, 2007, the first, a men's size 12 campus running shoe washed up on on Jedidah Island. Six days later, a size 12 men's Reebok on Gabriola Island. The third foot was found on Valdes Island in February of this year. It was in a men's Nike size 11. In May, foot number four, a women's size 7 New Balance on Kirkland Island. And then -- the fifth foot -- the match for number three ---washed up on Westham Island in June. One of the five feet has been matched to a depressed man, who disappeared about a year ago. A sixth shoe found in Campbell River in June turned out to be a hoax. Someone had put the skeleton of an animal paw along with a sock into the shoe, and packed it with seaweed. A hoax is something investigators in the U.S. are trying to rule out. They'll also see if the latest foot found matches a body found in the San Juan Islands last year. It was discovered with no feet. Investigators say they should know by the end of the week whether the latest foot is human. Then science will be called upon once again, to see if there is a connection to any of the feet found in B.C. According to a report by the Peninsula Daily News, a woman who declined to be identified, found the shoe in seaweed while walking along the shore. She reported it to the Clallam County Sheriff's Department on Saturday, the report said. Clallam County Detective Sgt. Lyman Moores said the shoe probably belonged to a man, but he couldn't identify the brand or size. Is footless body linked to B.C. 's severed feet mystery?